It is no secret that the Food Truck scene in Calgary is bigger and better than ever. There is such a diverse line up of trucks to choose from, touching on cultures both far and wide. They have become a regular sight on Calgary streets, bringing out large crowds at local events as well as during lunch breaks downtown. The notion of food on wheels, along with the novelty, has become an increasingly popular part of the Calgary scene; however, a new type of truck has been adopted into the scene and it's changing the way we Calgarians see trucks. The Crafted Artisan Truck is the unique brainchild of Pamela Morales. Pam took a hobby that she was truly passionate about and turned it into a creative, boundary pushing business that continues to rock the scene. 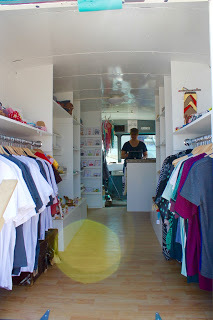 The Crafted Artisan Truck, a pioneer of the new wave of shops-on-wheels hitting the streets of Calgary, provides a wide selection of hand made goods for us shop-a-holics to indulge in. The best part? All hand made goods on the Crafted Truck are local, providing a city-wide platform for Canadian artists and creators to showcase their pieces of work. Crafted Truck goes beyond being a store, providing one of a kind private shopping experiences for events as well as workshops where local Calgarians can learn creative techniques from local artisans. I had the pleasure of visiting Pam at her truck and, I must say, it was a uniquely amazing experience. I was accustomed to seeing food trucks from the outside and interacting with them through their serving windows. Being invited into the truck provided me with a different view of trucks in general, opening my eyes to how the space could be utilized. Crafted Truck's wide array of artisan products caters to a wide audience, providing products ranging from handmade jewelry to beautiful material dream catchers. The interior was warm and welcoming, reminding me of an artisan boutique on wheels. Pam was gracious enough to speak a little about her personal journey and share how she defines her Calgary. What ignited the spark in you to start the Crafted Truck, a relatively new idea here in Calgary? For years I’ve been dreaming of having my own business but the cost of having a brick and mortar shop in Calgary has been too prohibitive. I was inspired by the overwhelming success of the food truck industry, the growing trend of pop-up shops and my love of everything handmade. Retail trucks are not just a new business, they’re a new way to do business. Being mobile we’re not just keeping our rent down, we’re also able to respond directly to our customers, wherever they are. Calgary and North American has been seeing a lot of food trucks and for me it seemed like a natural kind of progression to move into mobile retailing. Having a textile arts background and always trying out new crafts, the artisan truck just made sense to me. My goal was to find a way to showcase the creativity and craftsmanship of local artisans and makers and deliver it in a really unique way. What has been the most exciting part of owning your own business? Starting a new business with no formal training has been exciting for me because I love to learn new things. This was and continues to be a steep learning curve because of all the areas I’m responsible for but the more I learn the easier and more streamlined the process gets. Right now my non-work time is extremely limited. When I do make myself take some time off to recharge, I spend my time with my daughters and then like to immerse myself in movies in the evening once they’ve gone to bed. My job can be physically demanding at times and they are long days so just relaxing in front of the TV is all I have the energy for these days! Where do you see yourself and the Crafted truck in a year from now? 5 years from now? I’m in no rush to expand too quickly, if at all. I’m happy with where things are at and don’t see things changing very much from this year to the next. I’ll be changing up the products I carry on the truck from time to time and will continue to host a variety of workshops year-round according to what customers want. I also hope to be able to collaborate with other like-minded small businesses in one way or another. Over the long-term, I hope to be able to find a permanent space where I can offer both the handmade goods and workshops under one roof. How do you define your Calgary? Calgary is a vibrant, modern yet casual city rich in culture and creativity. The support, collaborative efforts of small businesses and healthy competition in our city make Calgary an engaging and rich community that I’m proud to live in. What advice would you give to someone who wants to turn their hobby and passion into a business? Make sure you LOVE your hobby because you’ll be living it morning, noon and night! Seeing the level of interest and excitement that customers have in discovering the diversity of products that local artisans create keeps me motivated. How do you build a successful customer base here in Calgary? Always keeping things fresh, new and ever-changing will keep bringing customers back again and again. Listening to the suggestions made by customers and following through with them also goes a long way to maintaining their loyalty. If you haven't already done so, I would highly recommend visiting Pam and the Crafted Artisan Truck. Pam and her innovative new truck are truly changing the way we see trucks in the city and will continue to pave the way for new spins on the traditional idea of food trucks. You can visit the Crafted Artisan Truck at the YYC Food Truck Summer Frenzy, taking place this weekend, June 26th - 28th, at Fifth Street Square! You can also keep track of where the Crafted Truck will be by keeping an eye on the schedule found here!